In the year 1491, during a steam-powered Renaissance, Rosaria Adalberto’s quest for a theory of electricity stands at an impasse. Though born of Venetian aristocracy, her status as a woman denies her the recognition and funding she requires to complete her research. Her fortunes change, however, when a mysterious patron approaches her. Elated at the opportunity, she accepts his offer—and is plunged into the thick of danger and conspiracy. With her life, her companions, and her love on the line, will Rosaria take up arms to defend her future? 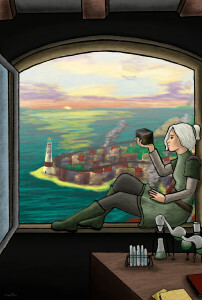 At this Renpunk adventure’s end, what price must she pay for her ambitions? Rosaria of Venice is the first installment of The Renaissance of Rosaria Adalberto. It is available in paperback on Amazon.com and in e-book format for Kindle. Rosaria’s trials do not end with Rosaria of Venice. In this age of revolutions, both radical new technologies and dark ideologies promise to change the world forever. Ambitious and talented as she is, Rosaria inevitably becomes entrenched in this battle for the soul of an era. The Renaissance of Rosaria Adalberto will continue in The Sin of Prometheus. Aaron M. Miner is a writer, filmmaker and entrepreneur living in Sunnyvale, CA. He is the founder of indie animation company Studio Kenaz LLC and its publishing arm, Gebobooks Publishing. In 2012, he directed the promotional music video “Falling in Flames” for the comic book and concept album Yumiko: Curse of the Merch Girl. He completed Rosaria of Venice while finishing his degree in Animation Production Management at Cogswell College. His full bio and blog can be found on his website at runicfire.net.